The Florence Reinauer Memorial Music Award. The Florence Reinauer Memorial Music Award for excellence in vocal or instrumental performance is given annually to a high school senior intending to continue his or her musical education at a school of higher learning. The Ridgewood Choral Scholarship Fund was instituted by the Choral in 1967, and five years later, B. Franklin Reinauer endowed the fund as a memorial to his wife, Florence. The current award to the winner is $2,500. Since its inception, over $42,000 has been awarded to encourage talented young musicians. Please consider making a tax-deductible donation to the Florence Reinauer Memorial Fund to ensure that young musicians will have the support they need to continue their musical studies. Donations are often made in the memory of a deceased loved one, to celebrate a joyous occasion, or even to honor a special event. To print the donation form, please click on this link: Memorial Fund Donation Form. The Marjorie Vandervoort Vocal Award in the amount of $1,200 was instituted during the 90th Anniversary Season (2017-2018) in honor of Marjorie Vandervoort’s 25 years of service as our Music Director. This award is intended solely for excellence in vocal performance. The Marjorie Vandervoort Vocal Award, is – as its name implies – only for vocalists, in contrast to the Florence Reinauer Memorial Music Award which the Choral has been giving for 51 years for either an instrumentalist or a vocalist. The Board has been aware for some time that in that competition vocalists are often at a disadvantage due to the fact that teenage vocalists have immature instruments, whereas instrumentalists have most often been taking lessons since early childhood. For this reason, and because we are a choral group, we thought it time to recognize the amazing talent of the vocalists who audition for the Florence Reinauer Award but do not win that award. In naming the award, we thought to honor our beloved director of 26 years, Marjorie Vandervoort. Just as Ms. Vandervoort continues to inspire us with the love of music, we hope that the Marjorie Vandervoort Vocal Award inspires young singers to pursue their passion for performing for many years to come. Donations to this fund are welcomed and are tax deductible. To make a donation to the Marjorie Vandervoort Award, please go to the Donations page, or simply click on this link: Annual Fund Donation Form. Acknowledgements of donations to either Award will be sent, and both the donor and honoree will be listed in the latest spring concert program. The Ridgewood Choral thanks you in advance for your support of our Awards, and the young and talented musicians they support. 2019 Florence Reinauer Memorial Music Award. Soprano Laura Cardona of Wayne, NJ has been awarded the 2019 Florence Reinauer Memorial Music Award. Ms. Cardona, a senior at Wayne Valley High School was selected for the New Jersey All State Chorus and the North Jersey Regional All Women’s Choir. She has performed lead roles in musicals at Wayne Valley High School, including Into the Woods, and Romeo and Juliet. At NJPAC she starred as Maria in a production of West Side Story and had the role of Beth in Little Women at the Manhattan School of Music Summer Music Conservatory Program in 2018. She also performed in Godspell We Beseech Thee and School House Rock at the YMCA theater in Wayne. At Our Lady of Consolation Roman Catholic Church in Wayne, NJ she serves as Cantor. She has studied voice with Laquita Mitchell for 7 years. 2019 Marjorie Vandervoort Vocal Award. 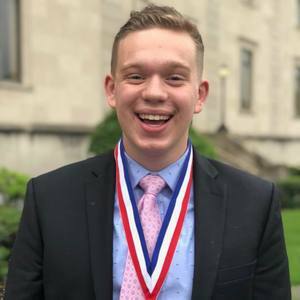 Tenor Joseph Bucci of Mahwah, NJ has been awarded the 2019 Marjorie Vandervoort Vocal Award. Mr. Bucci attends Mahwah High School, singing in a chamber ensemble under the direction of Mrs. Lynn Morneweck-Fuld as well as becoming a member of the MEBCI All Bergen County Chorus. While in High School, Joseph was part of the NJMEA All State Choir ranking 1st Tenor One in the State of New Jersey. In concordance with NJMEA, he holds a Governors’ Award in Arts Education with a concentration in Vocal Music. With the NJHSA Genesis Chorale he completed a National and European tour. Joe has participated in many benefit concerts in the surrounding area. Last year, he performed in Night of Future Broadway Stars to raise money for Covenant House, a charity that aids homeless youth around the United States. Joe is currently studying with Principal Artist Richard Bernstein of the Metropolitan Opera. Fawn Wiener, cellist, received her Ed.D. from Indiana Wesleyan University and M.A.cello from Brooklyn College. She studied cello with Marion Feldman, conducting with Jose Serbrier and Kurt Masur. Other musical studies were at the School for Strings, Dalcroze School of Music. She has performed with the Mountainville String Quartet, the Woodfield String Quartet, the Arkin Piano Trio and the Brookside Piano Trio. She has been Director for the Secondary All-District Orchestra of East Ramapo, and Orchestras of Spring Valley High School. She has also been cellist with Bergen Philharmonic, Yonkers Philharmonic, and former principal cellist of the Ridgewood Symphony. She has been on the faculty of the Manhattan School of Music Pre-College Division since 1995. Hanne Dollase, Danish contralto, is a sought-after opera, concert and recital singer who enjoys an ongoing relationship with a number of opera companies, orchestras and chamber ensembles in the New York City area. In the coming months she will be portraying the Marquise of Berkenfield in The Daughter of the Regiment and Katisha in The Mikado, both with Light Opera of New Jersey. Hanne is also a dedicated voice teacher and lives in Rockaway, NJ with her husband and two children. Michael S. Caldwell is a Voice and Opera Coach at Montclair State University’s John J. Cali School of Music, as well as a member of the Collaborative Pianists team there. He has enjoyed a wide range of musical and educational endeavors spanning the realms of singing waiter to music directing to professional vocal ensembles, and just about everything in between. Highlights include performing and music directing at The Deck House Cabaret in Bass Harbor and Southwest Harbor, Maine; coaching and singing at Opera Theatre of the Rockies’ Summer Vocal Arts Festival in Colorado Springs; and singing in the chorus of several opera productions at The Metropolitan Opera in New York. 2015 Davis C. Badaszewski (organist) (http://tempest.esm.rochester.edu/organ/students). 2015 Honorable Mentions – Marcus Jefferson (tenor) and Katy Wong (harpist) (http://www.katywong.com). 2014 1st Place Winner Tiffany Sun (flutist) (https://music.williams.edu/interview/interview-with-tiffany-sun-18-berkshire-symphony-soloist). 2014 2nd Place Winner Mark Serkin (cellist) (https://www.youtube.com/channel/UCmh7DcEs-3d-9GoogahoJqA). Lil and Len Rubin, of Maywood, (center and right) are shown presenting the $1000 award they endowed to Andrei Foca-Rodi, of Fort Lee, formerly of Hackensack. The presentation was made at the Richard Lane Memorial Composition Award Concert On October 14, 2006, hosted by The Ridgewood Choral, of which Lil Rubin is a long-standing member. In addition to music composed or arranged by Richard Lane, former accompanist of the Choral who died in 2004, the piano compositions of three finalists were performed at this concert, including Musical Moments, the selected winning piece by Mr. Foca-Rodi, a student at New Jersey City University. Richard Lane, an internationally recognized composer and accompanist for the Ridgewood Choral for over 35 years, wrote a wealth of music for instrument and voice. His talents were given to the Choral in the many choral/vocal pieces he wrote or arranged expressly for this women’s chorus. The Ridgewood Choral premiered “A Spring Bouquet,” written for us to celebrate our 75th anniversary, in 2003. And, in honor of the 90th Anniversary, the Ridgewood Choral will again perform “A Spring Bouquet” at its 90th Annual Spring Concert. Richard Lane was a teacher of piano and music composition, and a graduate of the Eastman School of Music. He was a member of ASCAP and Music Educators Association.